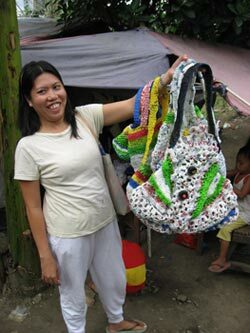 After Virgie had gained some confidence and enthusiasm for crochet, I asked her if we could go and meet the squatters behind the “great wall” in my backyard whom she’d known for years. Only 50 meters from my house, yet worlds away, 500 families live without running water, toilets, or electricity. 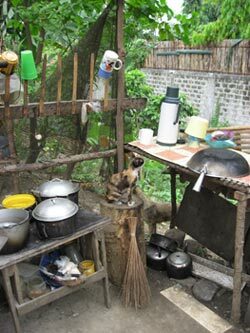 For 20 years, they have lived there, but they are still considered squatters. Every few years, the military destroys their makeshift homes, taking their belongings and chasing them away. Then they sleep under the trees, lay low, and after a few weeks, they rebuild their shanties with bamboo, old pipes, discarded billboard tarps, and whatever else they can find. There are rules for squatters: no substantial structures, no bricks, no wood. Our affectionate name for the group is Creek Club. 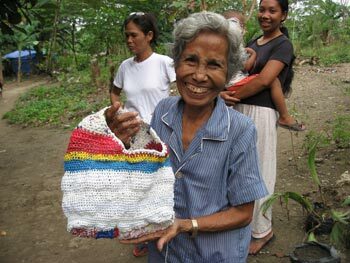 Their first bags looked like shrunken heads or popcorn balls, but not anymore. 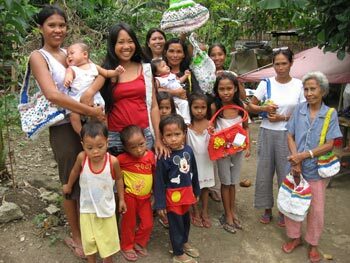 When I first visited them just before Christmas in 2008, Julietta, 42, was ready to give birth to her 7th child. Her two oldest kids are in college and support the whole family by working at a fast food restaurant. Her first husband was killed during a construction job, and her new partner now does the same work. Left photo, Virgie, trainer; right photo, typical kitchen. Lovely Loretta’s mother, 77-year-old Laurenciana, while visiting Loretta was interviewed for local TV as the oldest and newest crochet artist. Since they have no electricity there, she rushed back to her province (a 7 hour bus ride) to watch herself on TV and missed the next invitation to appear in the TV studio for a live interview. Three generations working with INVISIBLE.